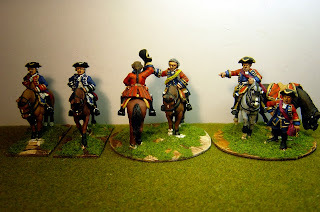 Top Picture: (left to right) Hessian infantry officer, Lippe Artillery Major, Hanoverian Lt.General and British Lt.General. Bottom Picture: (left to right), two Hanoverian Infantry Brigade generals, four British mounted command. 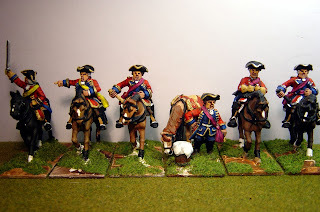 Next week I'm starting on Prussian Dragoons. Gorgeous brushwork as usual. The Lippe artillery officer is my personal favorite.